I just got back from more travels about these fine American States, which, of course, facilitated some much enjoyed hunting in unfamiliar territories. While that brought some luck that week's random retailer sales are what came in handy the most. A little of this, a little of that - it all adds up to yet another week with Spoils. I haven't seen this figure in ages so was fairly pleased to snag her at a store off the beaten path. I'm fairly over Marvel Universe these days, but I figure it'll be unlikely to see this costume again so what the heck. The body is a commonly reused one that had plenty of okay articulation and is sculpturally a little "comicbook" for my tastes, but what are ya gonna do? It's really the headsculpt that makes this figure stand out for me. It look great - a nice, normal looking face, the big "M" mask and a bit of hair overhanging it which adds a surprising amount of character. 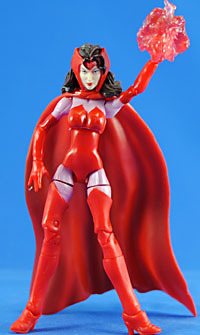 Plus she's got her cape and an odd bit of "magic plasma" for her hand. A nice addition to the collection. Aside from the freebies got when I saw the movie, I've managed to avoid this line most heartily, but when I saw this set on clearance my love of the Emperor and Unmasked Vader won out. Both trooper figures are pretty good considering the line (though both are my least favorite versions from their respective trilogies) while Vader and the Emperor are pretty cool. I like the "super deformed" aesthetic at play here though I would prefer the figures bit a bit larger and have more/better paint. The set also comes with two of the titular pods which are only welcome as their pegs allow each hemisphere to act as a stand. This certainly hasn't convinced me to get anymore but they do have a pleasant, novel quality to them. GRAIL HAUL!!! As with all things Hasbro, this second wave series of vehicles was impossible to find, so imagine my utter glee when not only finding this ship but scoring it a discounter for 50% off! It's a great new sculpt with some very nice features. I appreciate that the obligatory missile launchers hide in the engines but it's the cockpit that sells this thing. It's hinged for easy pilot sitting and so that a full astromech figure can fit in the back but it's the sliding canopy that I'm smitten with! The interior is well sculpted and appropriately "busy" though all details require many tiny stickers, so bully to that. Aside from the stickers the only thing I'm not impressed with are they tiny bits of landing gear so small they're practically not even worth it. 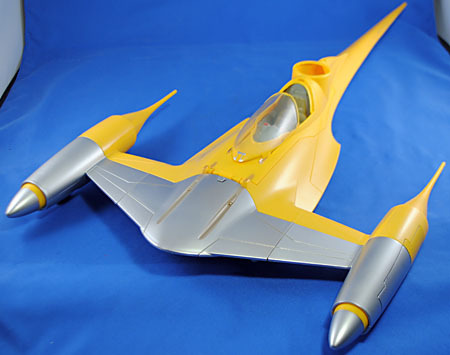 Regardless this is still an ideal, if not excellent, execution of a signature ship and it's really a shame this got the shaft when it came to being released. Finally found this guy out in the wild, though it was at Toys R Us so of course I got stuck with a miserable $5 upcharge. 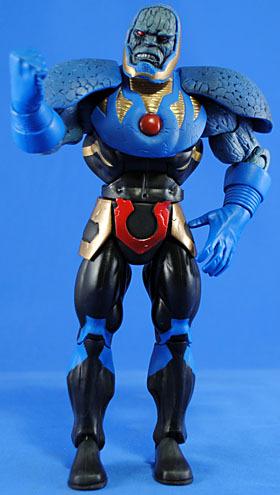 I really, really hate this redesign of Darkseid - the more I see it the more I just marvel at how unimpressive it is. Jim Lee, man... his X-Men are my favorite designs for that team but his New 52 junk is just a joke. I will say this for the figure, the proportions are not as wonky as they looked in photos/prototype, so that's a plus. I just... yeah. If I hadn't already opened him I would probably return him. As is his he can go to the "fake character" corner of my Fourth World Display with Dr. Impossible. 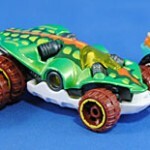 Back when I was hunting the Hot Wheels Fig Rig car I kept coming across the orange version of the Swamp Buggy and fought an ever increasing urge to purchase it. Then a couple months later I saw the green repaint and that urge became stronger and when I saw the beige one... well, my love of themes and repaints won out. This sculpt is a couple years old but for whatever reason Mattel's jammed out three repaints this year alone and they're all cool. Plus, at $1 a piece this slope is wildly slippery. I have fought hard to stick to just this and so far it's working but man... I love the look of this cool design in three "colorways" and I quite hope they do more. I know I said I was done with this "play feature" line but frankly this guy is just too neat to pass up, plus I'm a sucker for the cheap humor of his name. His featured outfit is a great, dark blue hat and coat to which a big wooden backpack is criminally glued. Push the parrot on the box and the sword spins around. I'll concede that's a decent play feature, but the "permanently attached" thing ruins the set for me. His alternate gear is a neat skull/ribcage piece which oddly enough has the eyes and mouth cut out so that this is essentially just a costume - that's disappointing at first but the more I think about it the more creepy and dark that is. 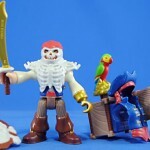 The idea of a pirate wearing a victim's skull to freak out his future victims seems like some McFarlane or NECA level morbidity subversively snuck into this kids line, and I love it! This set is a Kohl's exclusive and an excellent way to build an instant collection. 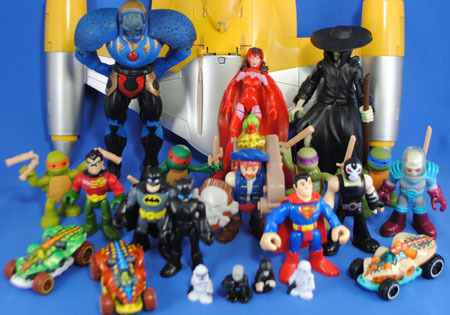 Freeze, Batman and Robin all feature the previous style of Imaginext figure, which is to say they are sculpturally a bit more detailed though they lack neck and wrist articulation. They're solid figures, though the paint isn't necessarily the best and Robin conspicuously lacks a cape. Bane and Catwoman are the current style so they are both sleeker looking and have the added articulation. Bane has very light green veins on his arms and chest which only show up under UV light unfortunately but Catwoman gets two accessories - her whip and a surprisingly detailed cat. The set has an SRP of $25 but I was able to get it for about 40% off making it all the better. 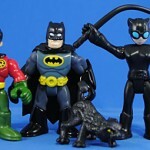 It's a great way to get the characters and remain focused of figures since Catwoman was only otherwise available with a giant motorcycle and Bane with the Arkham playset. I was shocked to see this guy at a Walmart but instantly snagged him since he is in the classic, aka proper, aka real Superman costume. He's an older style figure, so no wrist or neck articulation but I'll take simply to have a real Superman and not this New 52 malarky. 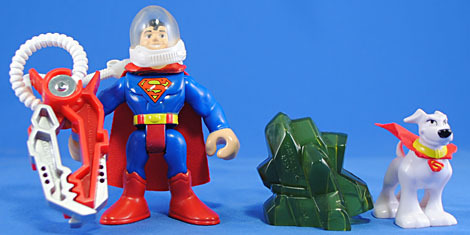 He comes with a neat space helmet and mega claw which helps handle the massive chunk of Kryptonite he's packed with. 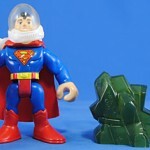 Sadly, the Kryptonite is a dull, dark green so though it is translucent (and hollow) is still doesn't look too good. But that's made up for by the ever novel inclusion of Krypto. It's not a great set but it is a must-have for me as this is the only costume I'd want from Supes (though I do think Electic Blue and Red would look great in the Imaginext style). Target was having a sale so I finally picked these dudes up. 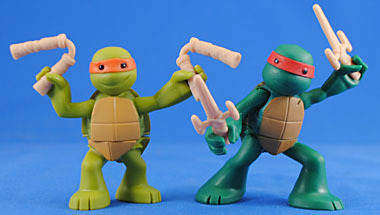 I love the Turtles so there's no way I was going to miss this super-fun variation on them but the figures are pretty disappointing and just a reminder of how little cash Playmates is willing to spend on making their toys. Each is sculpted in a fairly fixed action pose with only a swivel at the mid-torso, balljointed shoulders and a ball-and-socket head. There's very little one can do with them as a result and the fact these aren't a four pack adds a bit more insult to injury - I'd rather just have a more generic pose reused for all four if this all they're going to do with the characters. Paint QC has been all over, slight pun intended, on these kids primarily resulting in bizarrely splotchy bandanas and wandering eyes. I was pretty fortunate to snag sets with pretty solid paint though, so I'm happy. 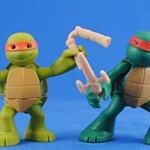 Each Turtle comes with "little kid" versions of their signature weapons cast in the same light-tan plastic and sans paint. 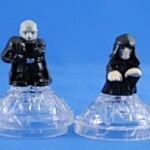 Again, "cheap" is the only word that comes to mind when I think of these two sets. 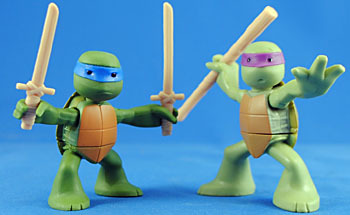 The novelty of "Toddler Mutant Ninja Turtles" does help take the edge off though, but no one should pay full price for these. When they first unveiled this new look for the Rat King I was pretty jazzed about it, but now that it's in hand... not so much. The figure is pretty decent - nice sculpt and acceptable paint (considering the line) - with better articulation than others, particularly the head's balljoint, but the coat makes it somewhat difficult to keep him standing. 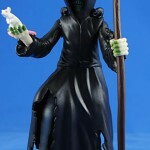 He comes with a white rat, which is pretty nice, and a bland staff. I would have liked a removable hat but my biggest issue are the three rats on his coat - each is cast in solid black and get no paint. I figured that was just a side effect of them being part of the coat but indeed each is a separately cast piece that is glued on! Really, Playmates!? There was absolutely no way you couldn't have cast them in brown or tan or gray or white or any other color than solid black!? It's becoming increasingly shocking to me how cheaply these figures are being made especially considering they have been the Number 1 selling action figure line since their release. I guess Playmates is still trying to recoup their losses on their utterly abysmal Star Trek and Terminator Salvation lines (both of which can still be found on TRU shelves). What if another company made LotR figures? 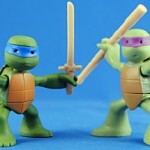 This entry was posted in Rustin's Spoils of the Week and tagged Batman, DCUC, Imaginext, Marvel Universe, Star Wars, TMNT. Bookmark the permalink. 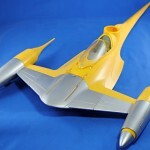 Our store (coughTRUcough) just got several cases of that Naboo starfighter wave. We get all the misfit toys. 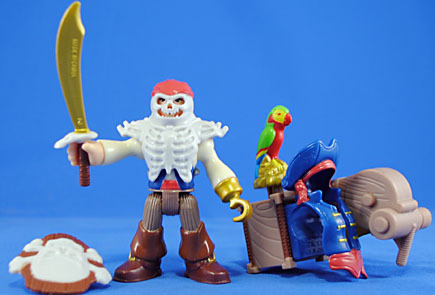 I'm still trying to decide if "Cliche the Pirate" was an intentional joke or a placeholder name that accidentally got the go-ahead because the naming department couldn't choose between "Hooky" and "Pegleg". I have to ask, Rustin, are you really rich and you can buy whatever you want without consequence? Or really poor from buying dozens and dozens of figures that you didn't even like in the package? I've never seen someone buy so many figures that they didn't like, even when they knew they wouldn't like them. 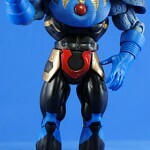 Cf Darkseid. I wish I knew you were in the market for Darkseid. I just unloaded mine on eBay. There's been a loan Darkseid warming the peg at my Walmart for the past 3 weeks. Apparently nobody is impressed with his new look. 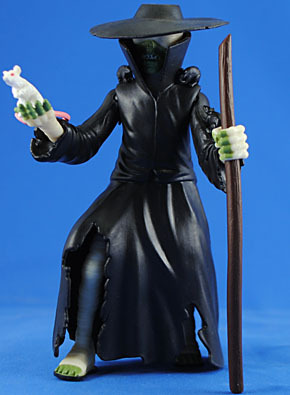 I'm not really a fan of the new look, I just wanted him because he was in scale with MOTUC --- but after the new car smell wore off I was stuck with a figure I wasn't in love with. I want to read more Spoils of the Week!